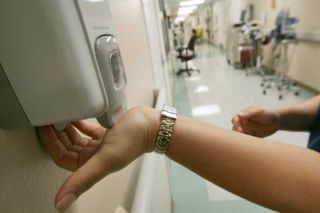 Just who uses these hand sanitizers placed strategically in hospital halls? : image via mysanantonio.com Some med students might think they are gods, but a new study conducted by the Institute for Medical Microbiology and Hospital Epidemiology at Hannover Medical School suggests that they may never have heard the old proverb cleanliness is next to godliness. Members of the third year class at Hannover Medical School in Hannover, Germany were given hygiene tests in which they had to answer which of seven scenarios demanded 'hand hygiene' (HH). Only 33 percent of the class was able to identify all five of these scenarios as required HH: 1) before contact with a patient; 2) before preparation of intravenous fluids; 3) after removal of gloves; 4) after contact with the patient's bed; and 5) after contact with vomit. Additionally, only 21 percent of the same students were able to respond correctly to a series of true and false statements about hand hygiene. Data available on nursing student compliance with HH standards show considerably higher adherence than medical students; however, the medical students assessed their own compliance as 'good,' and that nursing student compliance as inferior to their own. The medical students also believed that compliance with HH would be inversely proportional to the level of training and career advancement... meaning that they perceived that their trainers, those doctors actually caring for patients, were even less compliant with hygiene regulations than themselves. Stay clean and stay out of the doctor's office.